Alfred Laurens Brennan original etching "Divination in Tea Leaves"
Medium: original etching. This impression was published in 1879 by the American Art Review. 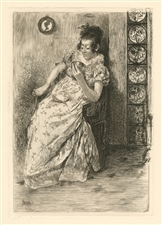 The American Art Review was a lavishly produced revue featuring original etchings by leading American artists of the era, which only lasted three years and is now quite scarce. Size: 8 1/4 x 5 3/4 inches (plate) with good margins. Signed in the plate (not by hand).